I love this time of year. Spring is simply awesome. When I lived in California, I would market-hop from one small-town parking lot to another looking for the best that season had to offer. There, the asparagus was perfectly green, the butter lettuce was making a grand entrance, and sweet smell of strawberries was just starting to emerge. It was turkey and mashed potatoes day in the cafeteria today. Our staff also celebrated the May birthdays today which comprised of a small potluck in the teacher’s lounge featuring the main event: chocolate cake. By 10:45 this morning, I was licking an already licked clean gravy spoon and using my first three fingers for what they do best: smooshing moist cake crumbs one by one onto my fingers to make sure not one morsel got left behind. Can anyone relate? Anyone? Mashed potatoes count as a veggie serving, right? Well, without going into too much detail, I didn’t sleep much last night. And if chocolate cake and mashed potatoes is what kept me going today, then so be it. 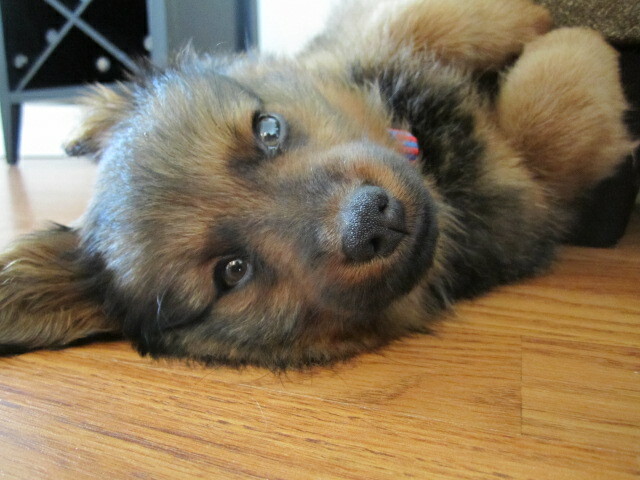 Our new addition, an adorable little sheepdog mutt puppy, is a handful. It’s a good thing he’s cute – it’s hard to stay mad at him for long. But, I have to keep remembering that he’s a puppy, and puppies do puppy things, that’s why they’re called puppies. Ah, I’m very tired. 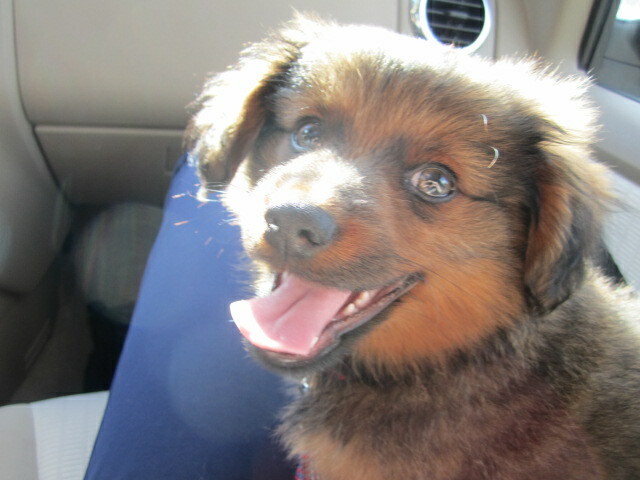 But I must say, our little Sig (named after Sig Hansen) is a dog after my own heart; he is a foodie. Well, maybe not so much a foodie, but a fury vacuum cleaner. It took Sig only a very short time to figure out that the kitchen is where the action is in our house, and the noise of the stove lighting and pantry opening will most likely trigger rogue crumbs. Per my mom’s great teaching, I’ve learned to be a fairly clean cook. That said, chopped herbs still often become airborne, and diced vegetables do have an occasional tendency to go AWOL. Enter Sig. He sits between my feet with one little paw resting on my toe, physically anticipating my next move. After the accidental kick or two, followed by a few choice words, he realizes he’s in the way and moves to a less precarious, but still observable position. 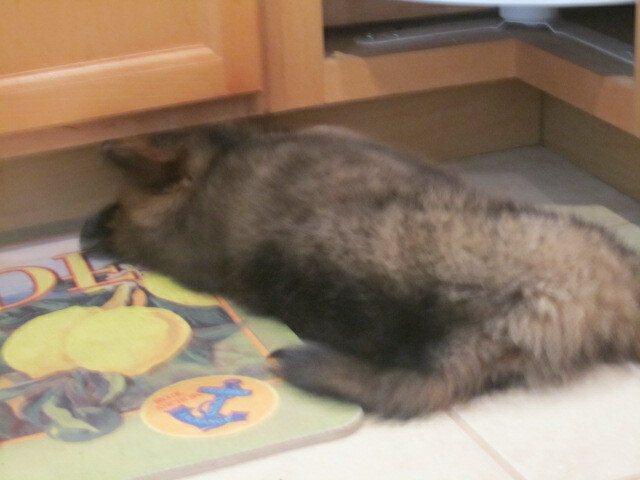 Then, while plates are coming together and dishes are about to be served, there will be one more inevitable soft trip over the sneaky little fur ball, as, by that time, his anticipation is overflowing and he’s sprawled out on his belly, his tiny hiney sticking out from under the cabinets as he goes to town literally licking up the pieces. Rob enjoys this, as he is the one who usually mops the floor every few days – Sig is making his job much easier. foods: pizza. My grilled pizza needs homemade pizza dough, and fresh ricotta. Both completely doable, but need time (I generally like to bulk ferment my pizza dough in the fridge for a few days, but this time I kind of sped up the process by letting it rise twice, and then bulk fermenting for a shorter time). Then it was onto the fresh ricotta and changing Rob’s face from are-you-crazy-disbelief to delicious amazement that we were actually going to make cheese. We made the cheese, and the rest was super easy to put together. My mom’s grilled mustard onions and some melon with pepper and prosciutto served as fabulous side dishes to our two grilled pizzas: White Pizza with Arugula and Spicy Mushrooms with Mozzarella and Basil. Brushing the dough with almost too much olive oil and then throwing it onto a super-hot grill makes a bubbly, crispy, and wonderfully chewy way to prepare the base. And on top of good dough, simple ingredients are all you need to keep the pizza modest and magnificent. Both pizzas turned out well, but we agreed the White Pizza was a definite homerun (and when Sig gets older, maybe he’ll even be treated with the crust, rather than just the crumbs). During the cooking process, Sig chased us around, hopping from the kitchen to the backyard grill, sensing the tangible anticipation of the exciting dinner. When we ate, he sat and looked at us – not begging, but in a way that was wondering why we got pizza while he got kibble. Such is a dog’s life, I guess. The night ended with a little bit of wine tasting and a very strategic game of Killer Bunnies with our neighbors. With leftovers to look forward to the next day, we all went to bed happy and full (including Sig). It was a fabulous way to celebrate the holiday. Preheat the grill until about 500 degrees. While grill is heating, prepare dough by sprinkling your surface with cornmeal. Spread the dough out using the tips of your fingers pressing out equally around the surface. Spread dough until you have desired thickness and shape (I like this pizza very rustic looking). Liberally spread the olive oil on the top of the pizza, and bring out to the grill. In a quick motion, lay the pizza dough on the grill, not over the direct flame (if using a gas grill). Cover and let cook for about 5 minutes. 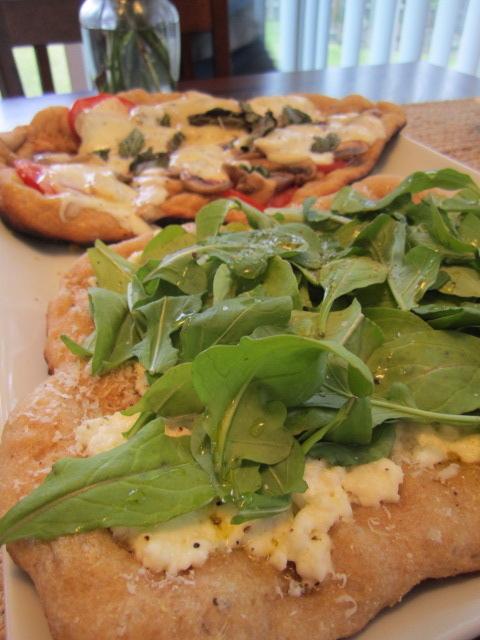 After 5 minutes, spread the ricotta cheese and sprinkle the parmesan regiano cheese on the dough. Then give a decent sprinkle of sea salt and cracked pepper. Heat until ricotta is slightly melted and creamy, and the dough lifts off from the grill without any resistance (the hot grill gives the dough a very crispy crust with a chewy, airy center). 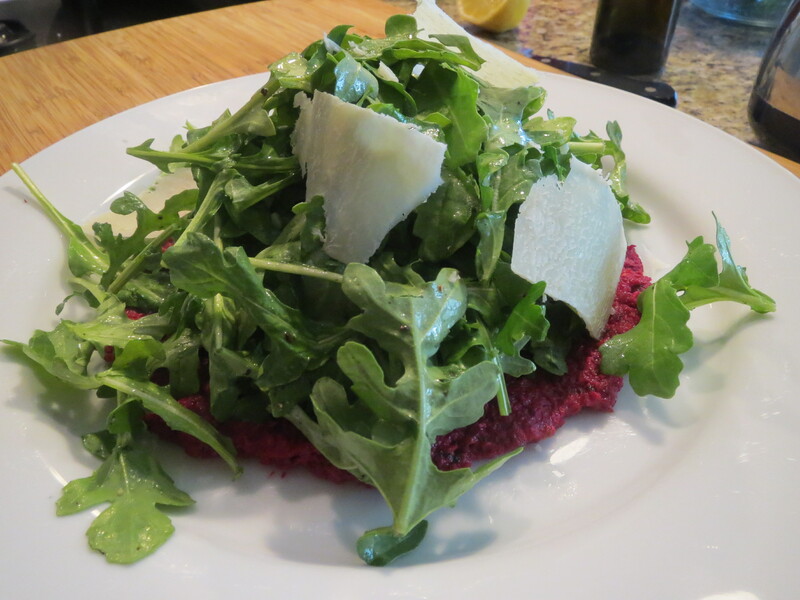 Place on serving plate, and while hot, pour on the baby arugula leaves, a drizzle of olive oil, a pinch of s&p, and squeeze the lemon on top. 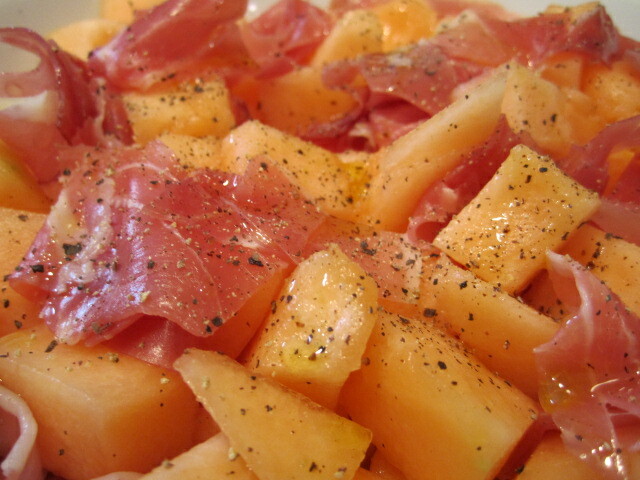 Serve with a great oaked chardonnay and red pepper flakes (for those who like a bit of spice!). Despite the many eye rolls from a number of the men I know (including my husband), I was one of the thousands of fans who woke up in the wee hours of the West Coast morning to watch Prince William wed Kate Middleton. While the workday last Friday was filled with much caffeine and stifled yawns, I wouldn’t have changed a thing about spending my sleeping hours awake and wide-eyed. As I’ve mentioned before, this Royal Wedding holds a place in my heart, not because I have any ties to royalty, or because I am one of the millions of screaming 20-something women grabbing their hearts and wishing it was them becoming a princess. It’s because at point I truly thought I was going to marry Prince William (there is an interesting story behind that thought). At 5:00 in the morning, right before the much anticipated Royal kiss, I made and ate my Royal Rosemary and Maple Bacon Buttie, and marveled at how such a good thing just happened in the world. With so much bad news these days, it was a breath of fresh air to simply watch traditional British Royalty in action, combined with genuine, true love. Little did anyone know, but only a few days later another day would go down in history for the U.S. as a long awaited great accomplishment – the death of Osama Bin Laden. Rob and I were finishing up his grilled Ribeye with Herb Butter birthday dinner when we heard the news Sunday night. Glued to the TV, our dirty dishes went un-clean as we watched our President officially deliver the news that would change history books forever. While our world is still nowhere near safe, at least one bad guy is burning in you-know-where. On the brink of all the world’s recent good news, another great merriment came when we officially celebrated Rob’s 27th birthday on Monday. We had his favorites: pigs in a blanket, Kelly’s guacamole with chips, pistachios, and Argyle Brut. Low key, flirty, and fun, we had a great time together with our low budget appetizers and fancy Brut. By 6:00pm, we were cuddled up on the couch, already in our pjs, with a Waterford crystal champagne flute in one hand, and a pig in a blanket in the other; I’m sure we were quite the sight to see. After a crazy start to the week, and as Tuesday rolled around, the hype of the Royal Wedding still hanging in the air, and Bin Laden’s death story continuing to evolve, we realized that a check back to reality was in order. Our little house needed a cleaning, bills needed to be paid, and laundry desperately needed washing. As much as I wanted to continue living in the fantasy land of weddings and birthdays, I knew the house couldn’t go unclean forever. So Tuesday night, Rob and I partnered up and divided tasks, and we cleaned house. At one point while cleaning hair out of a drain, I found myself wondering about the new Duchess Catherine – despite royalty, she is still a wife. Officer’s wife at that. Do she and William make house? Does she cook dinner for, or with, her man? Well, just the thought of dinner reminded me that while Catherine probably has people who can fancy up a dinner for her if she or William don’t feel like cooking, I, in my commoner ways, do not. On top of which, with not much in the fridge to work with, I had to become creative. After cleaning a toilet (that a boy also uses), it’s hard to be creative. To the pantry: rice and beans. While slightly boring, they are still healthy. There’s salsa. Mexican? No, Cinco de Mayo is coming up. 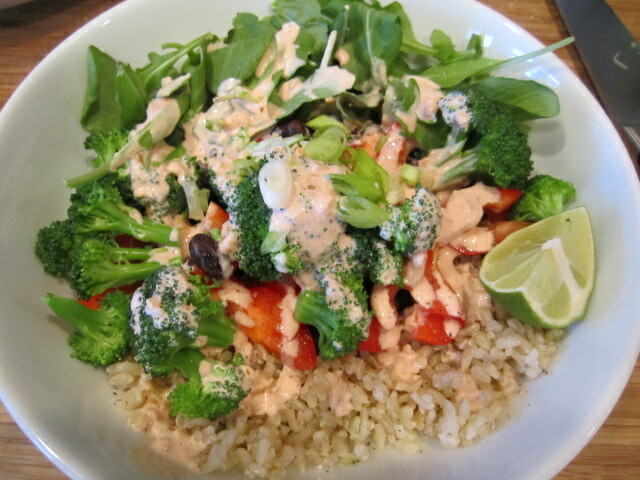 Thai curry sauce. Not enough veg in the fridge for a full curry. Fashion up a secret sauce? YES. One of our favorite sauces has to be Eugene’s Café Yum sauce. It’s unique and creamy and tangy. They do sell bottles of the sauce now, thus giving away its recipe. Café Yum is such a, well, yummy place to eat with really easy and satisfying food, and they put their sauce on almost everything. But due to lack of time, energy, and resources (and the fact that Eugene is two hours away), I decided to create my own. ¼ c your favorite jarred authentic salsa, preferably not chunky. Boil a small pot of water; salt when boiling. Toss in the broccoli florets, and blanch for about 1 minute. 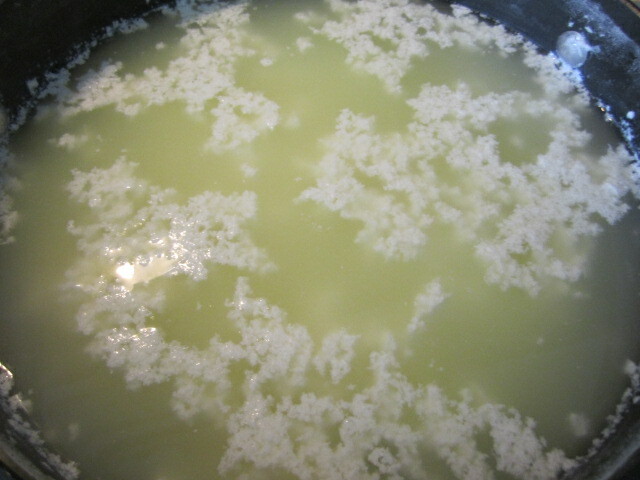 Remove from water, and put into a salted ice bath to stop the cooking. To make the secret sauce, mix the salsa, mayo, and cumin together in a bowl. Taste for seasoning (may need pepper, but probably not any salt because the salt content of many jarred salsa can be pretty high). Cook the rice per microwave instructions, and split into two bowls, positioning in one-third of the bowl. Add the beans to the middle of the bowl, and then add the arugula to the third side of the bowl. 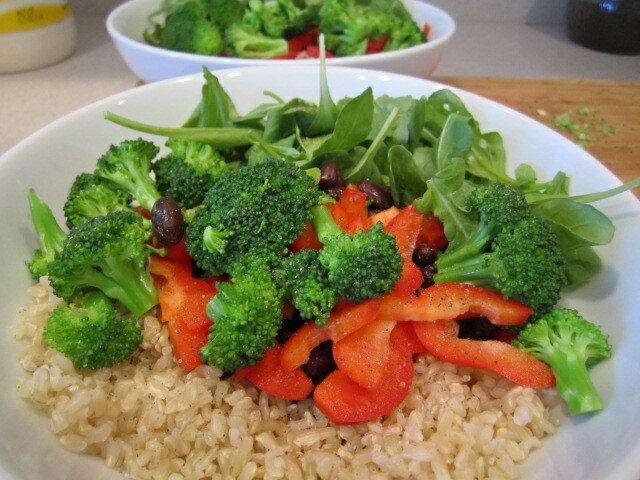 Top with broccoli, red peppers, and sprinkle with a bit of s&p. Top with desired amount of secret sauce and the scallions. Serve with a squirt and a wedge of lime.